Can you handle the spooky stories of past Williamsburg residents? 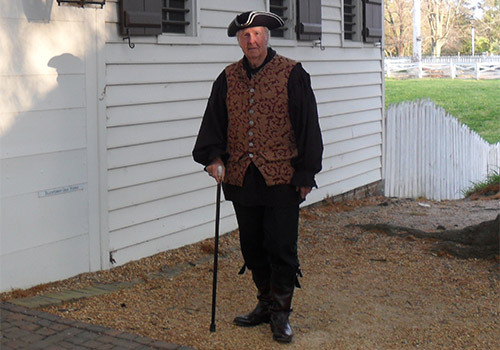 Follow your ghostly tour guide as you roam the historic streets of Williamsburg and listen to true tales from the 18th century. Keep a camera handy—you never know what paranormal sights, sounds, and feelings you might experience along the way! 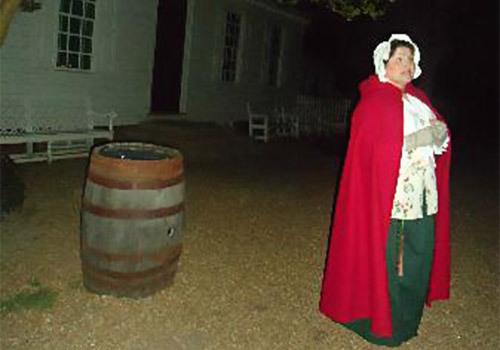 Will you brave the chilling night to hear the stories of Williamsburg ghosts? Appropriate for all ages, but some children may be frightened. Bring a camera, comfortable shoes, and a jacket. 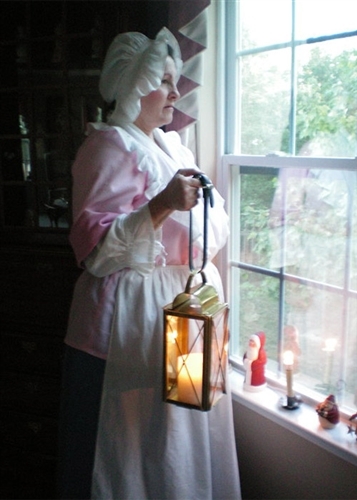 Tour guides dress in historic costumes and carry lanterns. Tours leave promptly at scheduled departure time. Hear factual stories of real ghosts who inhabit the town of Williamsburg. Follow your costumed, ghostly guide down eerie streets, by candlelight. A first-person tour, your guide becomes a ghost from the 18th Century, who lived and died in this very haunted town. You will experience the Peyton Randolph House, the most haunted in Virginia. Guests often see and hear strange, inexplicable sights and sounds, so you will not want to attend without a camera in hand. A truly one-of-a-kind, unique tour you will not want to miss! This original tour is what our business has been built on. Our success is because of this unique and fun tour. 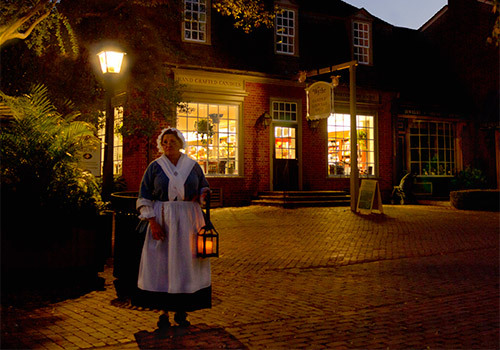 Presented by the ghost of an 18th century character from town, you will be taken down the hauntingly scary streets, by candlelight. Suitable for all age groups, children love the character in costume as older guests fully understand the fully researched ghost stories that are told. This tour is not a history tour. Children ages 6 and under are free. What is a ghost tour? 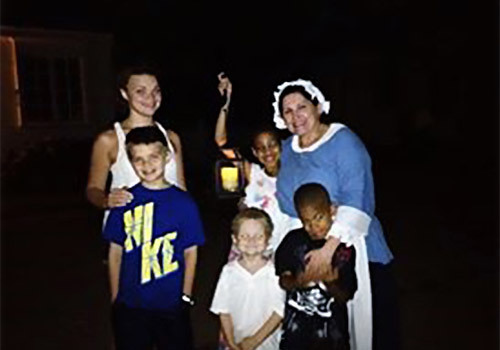 Your tour guide will tell ghost stories, while walking you through town, in the dark night, by candlelight. You will hear of ghostly encounters which have been thoroughly researched and documented. Stories have been reported by security officers, employees and residents of the town. Do we get to go inside the buildings? Since we conduct our tours in the historic area of Williamsburg, no ghost tours are allowed to enter these 18th-century buildings. You may walk up to the buildings, however, once the tour is over. 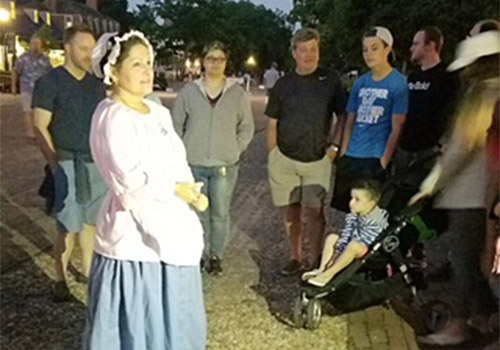 Tickets to Colonial Williamsburg may be purchased for entrance to many of the buildings, during the day, but are not needed to attend one of our ghost or witch tours. If it rains, tours will still be conducted. Bring an umbrella or rain jacket! Are restrooms available throughout the tour? Restrooms are available, though generally not along our tour route. They are easily accessible a short distance away, however, so you may walk to one, if need be. If you arrive late, you will miss the tour. Tours depart promptly at their scheduled time. Dogs are welcome on the tours. Please see that your dog is friendly, on a leash, and please be sure to bring the appropriate supplies to clean up any messes. Can I take notes on the tour? Due to the tour being copyrighted, note taking is strictly prohibited during the tour. Can I videotape the tour? No. This is also strictly prohibited for copyright reasons. Yes. Photography is permitted on the tour. Can I bring food or drinks on the tour? Yes, so long as all beverages are non-alcoholic. Can I smoke on the tour? No. The tours are smoke-free.